Such a beautiful Wedding day! 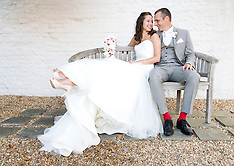 Stunning Sarah and Sam created a wonderful day full of relaxed fun and beautiful things. They had an African themed room for their celebrations with gorgeous bight warm pinks and mauve's and lavish greenery. A hint of country "rusticness" thrown in, just lovely. So all in all my job was a breeze! Just look at that dress and how absolutely gorgeous Sarah looked along with how beautifully besotted her well groomed man was! 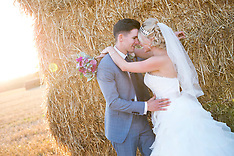 We had a gorgeous summers day and I was lucky enough to get the timing down for the most stunning golden hour couple shots ever. Rookesbury Park provided the perfect scene and the bridal party all looked fabulous. Quite simply a beautiful day. Wow wow wow!!! What else can I say. Kiri and Oli's Wedding has to be one of my most favourites ever! I loved every detail from the stunning dress suiting the gorgeous Kiri perfectly along with the bright red bridesmaid dresses and incredibly smart groomsmen. To the Japanese theme delicately dressing the venue in the simplest little touches, the amazing venue itself Southend Barns in Donnigton, Chichester The guests were wonderfully fun and welcoming and the weather showcased itself in everyway possible from thunderstorms to the most stunningly unbelievable sunset hour. Who needs disco lights when you can flood the venue with a sunset during the first dance hey?? Summed up .... just WOW!! !